Calcipotriol directly suppresses the expression of IL-36α/γ in mouse skin, but the effect of dexamethasone is indirect. 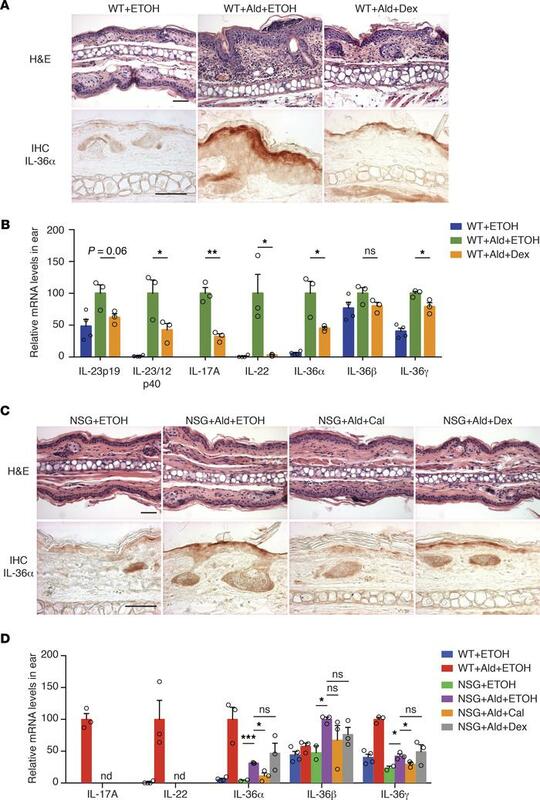 (A and B) Topical dexamethasone (Dex) reduces IL-23/IL-17/IL-22 as well as IL-36α/γ expression in mouse psoriatic skin. WT Balb/c mouse ears were topically treated with ETOH, Aldara (Ald)+ETOH, or Ald+Dex from day 0 (D0) to D3, with ETOH or Dex in the morning and Ald in the afternoon, as shown in Figure 1A. Ears were analyzed at D4. (A) H&E staining (upper panel) and IHC staining with IL-36α antibody (lower panel; positive signals are in dark red). Scale bar: 50 μm. (B) qPCR analyses of ears. Values are mean ± SEM. *P < 0.05; **P < 0.01 (2-tailed Student’s t test). Data are representative of 3 independent experiments with similar results. (C and D) Calcipotriol but not dexamethasone inhibits IL-36α/γ in Aldara-treated immunodeficient NSG mouse ears. (C) H&E staining (upper panel) and IHC staining with IL-36α antibody (lower panel; positive signals are in dark red). Scale bar: 50 μm. (D) qPCR analyses of the treated ears. nd, not detected. Values are mean ±SEM. *P < 0.05; ***P < 0.001 (2-tailed Student’s t test). Data are representative of 2 independent experiments with similar results.